With GPS Navigation & Maps by Sygic you can enjoy FOREVER FREE: offline TomTom maps, POIs, route planning & free map updates. 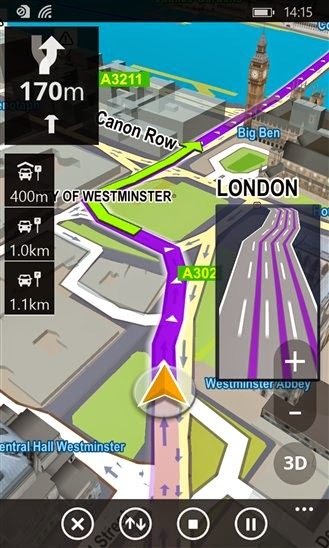 High quality maps from TomTom and other providers are stored on your Windows phone, tablet or SD card for use without internet connection. To get the most of the app upgrade to premium and enjoy lifetime: 3D maps, turn-by-turn voice-guided navigation, lane guidance, speed limit warnings & junction view with lane indicator arrows at complex intersections. Enjoy FOREVER FREE: GPS, offline TomTom maps, POIs, route planning & free map updates, or upgrade to Premium Lifetime Navigation. GPS Navigation & Maps app by Sygic is The World's Most Installed Offline GPS Navigation App powered by TomTom Maps.